Goodreads: When Maggie Baxter, a practical, rule-following accountant, finds out what her chocolate Lab ate, her world turns upside down. Maggie thought she had the rest of her life meticulously planned out, but now she needs to figure out Plan B. 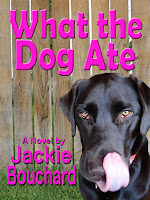 With her dog, Kona, as her guru, Maggie embarks on a funny, heartwarming quest in search of tail-wagging joy. Kritters Thoughts: The reader finds Maggie as she is learning through a vet visit that her husband has been cheating on her behind her back and from there the story unravels (good unraveling). Through Kona her dog, Maggie comes to find out the truth about her marriage. I think this is only where the story begins, it went further than I ever thought it would be and I was pleasantly surprised with each chapter! The one thing that always kept sticking out with me was the ability for the author to avoid the "woo is me" divorced woman attitude and instead have her question her job and ultimately her life in a positive light. I didn't find Maggie to be whiny or down in the dumps, she hit some speed bumps, but wasn't overwhelmed by her grief, it didn't completely stop her. The cast of characters was unique. The different personalities that surrounded Maggie were entertaining, but gave the story a great human element. I appreciated each character's role and can not imagine the book without each one of them showing up when Maggie needed them to. Of course, I could have thrown a shoe at her estranged husband - Dave, written well, but what a jerk. As a pup owner, I loved the emphasis on dogs and their abilities to help a person heal. The author used the dog at the right times to show unconditional love, this could be a great book to give to someone to encourage them in times of trouble to get a pup! I'm going to review this one soon!